The Gingko GuestHouse is a 3-bedrm, 3 FULL bath Portland, City- Permitted vacation rental in the heart of the Alberta Arts district. From here, you can sample your way through local brews, food carts, wines, ice cream, and many different coffee roasters and breweries. You can reconnect with family and laugh with friends. You can relax on the front porch or BBQ on the back. ✸ Your reservation is ♦SECURE♦: We have a proven track record and years of happy guests. We also have a required City of Portland short-term rental permit for houses with up to 5 bedrooms. (LU 15-26xxxx CU), making your reservation secure. 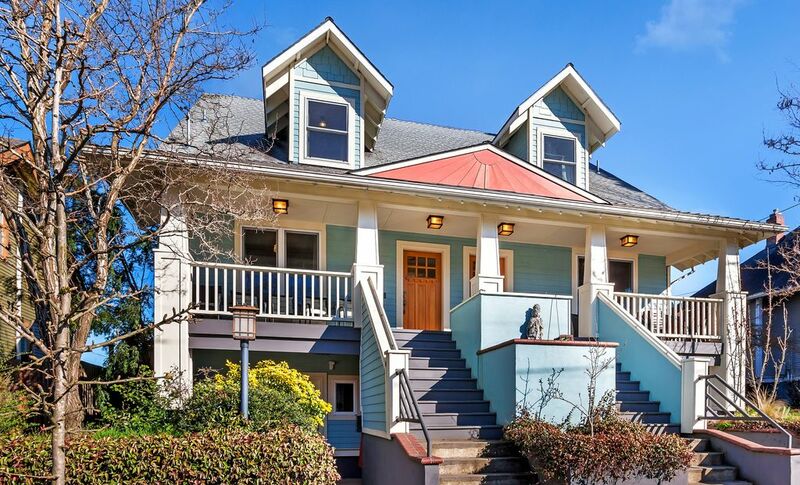 ✸ We have an excellent LOCATION: Located in Northeast Portland, in the heart of the Alberta Arts District, The Gingko Guesthouse is within 2 blocks of restaurants, bars, breweries, shops + much more. We’re also just a 15-minute drive/Uber ride to downtown Portland, easily accessible to the airport, greater Portland adventures, and the beautiful Columbia River Gorge. ✸ The home is WELL APPOINTED: We’ve left no detail ignored. From spices to bottle openers, from complimentary toiletries to ample seating for your whole group, Home Name is equipped with everything you’ll need. (except your clothing and food). ✸ There is PLENTIFUL SPACE for large groups: Our home features: a large upper levels open concept living area, full kitchens, 3 TVs, 3 bedrooms (5+ total beds) and 3 full bathrooms to sleep a maximum 6 adults (the sweet spot of double occupancy) + 1-2 children, or we can discuss your guest make-up. We do have flexibility in your group’s needs. Kindly let us know..
✸ There’s OUTDOOR LIVING: A front porch perched above the street is perfect for enjoying a quiet moment to yourself or having a drink and conversation with friends and relatives. The private backyard and deck are great for BBQ’ing, warm-weather meals, relaxation, and even seasonal fruit-picking. 2-3 night minimum in winter. Feel free to book. When you want to explore further afield, The Gingko GuestHouse is just a 15-minute drive to downtown – close to everywhere and everything you’re here to see and especially do. Including the Coast, the Gorge, Wine Country, and the whole of the greater Portland area. ✵ Renowned pubs, restaurants, coffeehouses, bars, and farm-to-table cuisine, including Salt & Straw, Bernie's Southern Bistro, Yakuza, Beast DOC, and Wilder, not to mention 16th and Killingsworth with Hat Yai, Handsome Pizza, Podnahs Pit, Pine State Biscuits, Proud Mary and food carts/food trucks, and PIZZA galore. ✵ Kennedy School/McMenamins: This historic school building has been renovated into an Alberta Arts must-visit, with restaurants, bars and taverns, a brewery, cafés, gift shop, spas, movie theater, soaking pool, & more! ✵ 30th Street Restaurant District, with coffeehouses, bars, and restaurants headlined by well-known chefs: farm-to-table cuisine, fusion meals, craft cocktails, and so much more – a real foodie heaven! ✵ Shopping – boutiques, consignment shops, art galleries, and more – with NO SALES TAX! ✵Our goal is to make your Portland stay exactly what you want (and need) it to be. In all seasons except winter, we generally require a 3- -5 night minimum, if you will be staying over a portion of a weekend. That said, there are always many exceptions: calendar dynamics, existing bookings, etc. Please contact me. I’m friendly. ✵Sorry, we can no longer accommodate large groups of men, unless you're over 60. Or with a church. ✵ We’re owner-managed: Bella, your hostess, is very invested in your experience and will offer one-on-one support before and throughout your visit. ✵ Please, get in touch. Our response time is FAST (usually, under an hour) and, once we’ve discussed your basics (price, group size, availability), we’ll happily finalize your reservation. Thank you for your understanding. ✺ Upper-level Master Ensuite: King-sized bed, TV, and a private, ensuite bathroom with a shower. Cribs are available, upon request. ✺ That’s a total of 3 TVs throughout, with Satellite and/or Internet TV, AMPLE FREE STREET PARKING ON OUR BLOCK, and WIFI. ✵We are happy to offer The Gingko GuestHouse as an allergy- and eco-friendly home, from our cleaning products through to a low-allergen environment. I’ve lived in (and loved) Portland for 24 years. My children and I love exploring greater Portland and especially our own front yard: the creativity and vibrance of Alberta Street – the restaurants and food trucks, museums and shops that our neighborhood has to offer. Of course, we love sharing Alberta Streets with other families, too. And, we hope, with you! Northeast Portland and, specifically, the Alberta Arts District offers the best of the The City of Roses: so many incredible eateries (restaurants, food trucks, street carts, cafés, breweries, and more! ), shops, museums and other creative outlets, just minutes from our front door. You can walk to the grocery store and pharmacy. We have access to several public transportation routes and highways to downtown, the coast, and to the Gorge, Wine Country, Hood River, and Multnomah Falls. And Alberta Street is also close to downtown (just ~15 minutes by car) and very convenient to the airport, too. This is one of the very few large permitted homes in Portland – and one of the largest in the Alberta Arts District. It’s about more than our number of bedrooms, though: the Gingko GuestHouse is a newer building in a lovely residential neighborhood. And it has everything you need. Over the years, we’ve learned from our guests and gone beyond the basics (fast WiFi, satellite TV, etc.) to slowly add all the bells and whistles – everything from hip furnishings and two washer/dryers, right down to complimentary toiletries and a fully equipped kitchen. Last year we updated the home. This year we will be enriching the decor more and more over time. Towels, hand soap, blow dryer, and a shower and/or tub in each bathroom. Large table seats 8-10. Dishes to accommodate that as well. Place to lock your bikes out of rains way. There is a bicycle rental place right on Alberta St. The property is clean, well maintained, and well appointed with everything you could need. Everything seemed new or in excellent condition. It is a multiplex and we heard VERY little noise from the other tenants. The hostess Belladonna was helpful and attentive if needed—we had zero problems with the house or the stay in general. Lots to do within walking distance Alberta and Killingsworth. Overall I highly recommend this property! Bella was an amazing host and was very accommodating. The house was clean, cute, and perfect for a large group. The location is close to Alberta and parking wasn’t a problem for us. I would recommend Bella and this wonderful property. Bella was very responsive to our questions and needs. There were many amenities for travelers in the living room: maps, games, etc. Lovely porch, beds were comfortable, bathrooms had ample space and towels. The kitchen was small but had every convenience for cooking and meals. The neighborhood was colorful and well- located with many stores in walking distance. We would consider future visits, thank you, Bella. Bella was easy to work with. We felt like this was a personal endeavour for her not just a faceless booking experience with a manager. The house was easy to find and we had a rental car and parking was easy. Although the weather was bit chilly, everything was so close we just walked to eat and drink (everything you can imagine they hand make locally in Portland, it' s nuts). The food was really good everywhere we went. And we we drove to the beach one day, and to Multnomah Falls athe next day. Wonderful home with plenty of space for all 6 of us. The property is perfectly located in a great neighborhood where you can walk to the market and cafes and great shops. The owner saved us at the last minute and was extremely helpful. Loved everything about this place! Highly recommend staying here. We were 3 couples sharing Bella's beautiful house in NE Portland. All 3 bedrooms were very comfortable and nicely appointed - each with a private bathroom - beds were excellent and everything we wanted or needed was provided. The kitchen also had everything we wanted and we relaxed in the dining room and living room. The house is perfectly located in a quiet residential area, and just 3 blocks from restaurants, shopping (groceries, etc) and two different bus lines. We took full advantage of the senior $2.50 fee for all day public transportation and rode the buses, metro and trolleys throughout the day - Portland has the friendliest bus drivers in the world! Also 3 blocks away is Alberta St - which has dozens of restaurants and food options. Bella was very attentive to any need we had, and often offered good suggestions for our interests. Temps were unusually high during our stay, but the house AC kept us comfortable - and the plums from Bella's gardens were delicious. We liked Jake's Crawfish, Mother's Bistro and Henry's Tavern in downtown Portland - which is a very friendly city and offers beautiful gardens and lovely buildings. We also highly recommend Erik's Free downtown walking tour, which starts at City Hall across from Pioneer Square. We definitely recommend Bella's house and will stay there on our next visit to Portland. I swear I didn't write this review. Nor trade it for a free stay. We were pounded this year with a record - breaking snowy and cold winter, rain in between, and then a super record- breaking summer of heat. Not everyone could stand being outdoors in this unusual heat. I'm glad that despite this , you still enjoyed all that the house and the neighborhood and our city has to offer. I guess all the extra "weather" we've had this year was the magic key to my grafted 4-type plum tree. Lucky timing you got to enjoy them. They were falling by the dozens! We couldn't keep up with catching those, despite effort. And you even went on an outdoor walking tour. I'm putting that on the to -do list. You booked this trip's location far in advance of your vacation, and I'm really glad it met your expectations and beyond. It goes without saying, that Bud, you and your friends are welcome anytime! Welcome to this Hip walkable neighborhood with ample cool shopping, coffee, relaxing, eating at restaurants (and carts) galore with foods from around the world, sipping wine, soaking in the McMenamins soaking pool, Common Grounds Wellness Center (hot tubs), drinking micro brews at the local pubs, biking, easily accessible public transportation, etc. All the fun to be had in Sustainable Portland- you can get a microcosm of it in the Alberta Arts neighborhood! Seriously, convenient and entertaining location. Come see for yourself. And Come Hungry! It has countless amenities with-in and also in the neighborhood. Drink Oregon's incredible micro brews, and even homemade fruit soda, the grocery store, pharmacy and many businesses are a few short walking blocks away. WALKING distance to many great eateries, locally roasted coffee, cafes, amazing restaurants, trendy shops, Kennedy School (Soaking tub, 2nd run movies, bars and restaurants), Alberta Arts Last Thursday, Common Grounds Wellness Center, New Seasons Natural grocery store, hot tubs, and so much more. Three close highways to take you downtown, out to coastal beaches, to the Columbia river Gorge, Hood River, skiing or Multnomah Falls for the day. Welcome to the hip Portland neighborhood of Alberta Arts. MINIMUM WEEKEND RENTALS, YOUR SATISFACTION, & INSTANT BOOK Several in between stays available still! Our goal is to make your Portland stay exactly what you want (and need) it to be. In all seasons except winter, we generally require a 4- or 5-night minimum, if your stay is over a portion of a weekend. That said, there are always many exceptions: calendar dynamics, existing bookings, etc. Please contact me. I’m attentive. We’ve rented our home for years, and we’ve learned from experience that your booking goes smoother, your trip is better, and you and everyone in your group are happier, if we communicate prior to booking. Please, get in touch. Our response time is FAST (usually, under an hour) and, once we’ve discussed your basics (price, group size, availability), we’ll happily finalize your reservation. Thank you for your understanding. ** Cancellation Policy: If Guest wishes to cancel his/her reservation, the deposit paid thus far will be refunded as follows: 50% returned if cancelled > = 60 days prior to Check in date 0% returned if cancelled < 60 days prior to the Check-in Date Note on the DAMAGE DEPOSIT: I charge a $69 accidental damage fee of up to $1200 in damages. We never anticipate damage, and in 6 years, I've found my guests to feel the same way.